Paris Fashion Week closed out a month of international designers touting the best of what's to come for Fall/Winter 2017. Perhaps with a nod to the political chaos affecting our world, many French designers looked to the escapism of the sky for inspiration. Looks featuring celestial elements were definitely trending on the runways in Paris, so you can expect supernatural style to be big. Chloé's minidress had a chic graphic print with faces and shimmering stars. Dior showed several looks with the phases of the moon printed with beautiful effect on sheer black tulle. 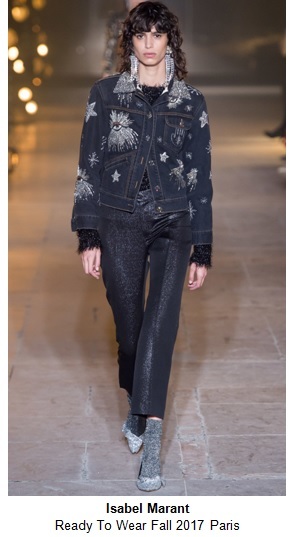 Isabel Marant's street-style ready denim look was embellished with stars and a glittering lapel. Manish Aurora showed galaxies and rocket ships embroidered on this cocktail dress, which was accessorized with a planetary bag. A gorgeous sunburst highlighted Alexander McQueen's ethereal top, accentuated with feathers over wide-leg pants. Mugler chose to use star shapes as the cutouts on skirts, dresses and jackets in this collection, unearthing cool new silhouettes. At Nina Ricci, gold and navy stars were printed on skirts and dresses to amp up an otherwise Western theme. Space Cowboy chic, if you will. Finally, at Karl Lagerfeld's spectacular Chanel show, complete with an explosive rocketship liftoff, chic dresses covered in astronaut prints were paired with glittering space boots. For Fall 2017, there will be many options for this trend, whether you want to go full-on galactic glam or just add some cosmic cool to your wardrobe. From graphic lunar prints to sparkling star accessories, a touch of the ethereal will make you look out of this world.